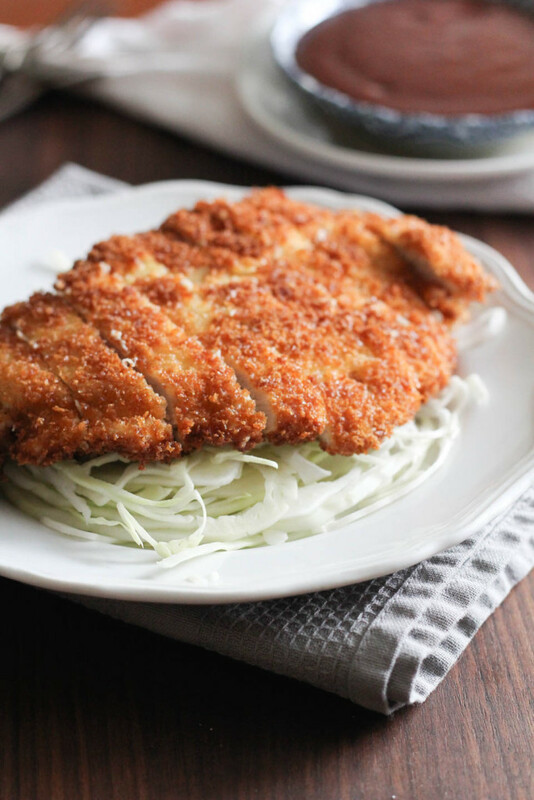 Chicken Katsu is Brian’s favorite Japanese simple dish. Even when we go to sushi, he usually orders this with small amounts of sushi. So after seven years of being together, I finally made it for him lol! It’s so easy to make, which makes it kind of funnier that I have never made it. I was leaving for Southern California for my nieces birthday, so I made this for our date night the night before I left. We have weekly date nights, sometimes we stay in, other times, we go out. Often times when I am leaving town, I want to stay in with the kitties and Brian, and not go out. I am the kind of person that needs to stay home a couple of days before I go out of town, and need some grounding time when I get back from being out of town, or if I have had a lot going on. It took me a long time to really pin that down about myself. But now it is a must for me to get my bearings back, center, and revive myself after trips. So often times, if we have had a crazy week of work, by Friday or Saturday we don’t want to go out into the world, reservations, dinner, crowds, we want to chill. So I’ll pick up our favorite foods, something special, and we make dinner in for date night. This chicken katsu, while not fancy, it was nice to stay in and connect before I left for a week. That’s just how we do things, we like each other a lot. 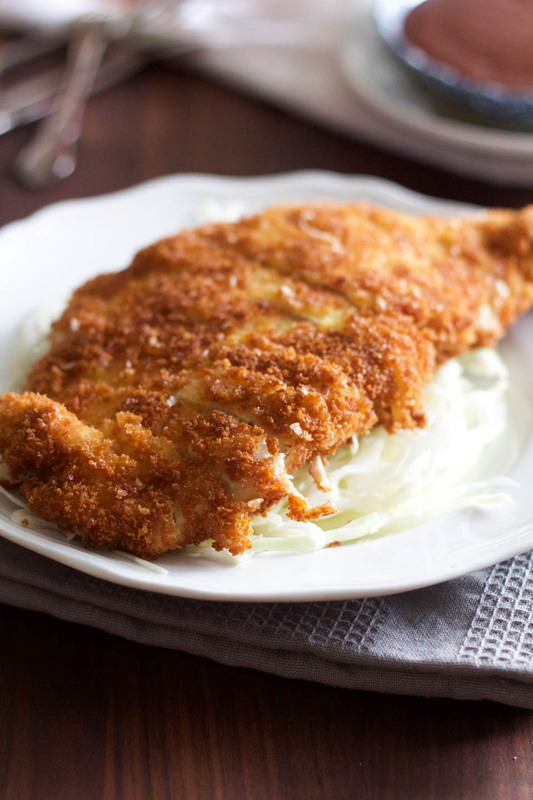 Katsu sauce is an Asian BBQ sauce that is perfectly tangy and sweet for this savory, crunchy chicken coated in panko bread crumbs, a serious great date night, and family night meal! Tonkatsu sauce recipe adapted from Saveur.com. Chicken kastu with tonakatsu sauce is best served over a bed of thinly sliced cabbage, and a scoop of rice. About 2 cups cabbage, and 2 cups rice. 1. For the sauce- whisk all in ingredients in a small bowl. Note: pounding chicken to an even 1/2 inch thick is very important for cooking evenly. It can get messy, so here are two ways of lightly pounding the chicken breast. place one chicken breast in a gallon size bag, close, lightly pound until 1/2 inch thick. place chicken on cutting board, cover with parchment paper or plastic wrap, lightly pound until 1/2 in thick. 2. Place flour, egg, and panko in shallow pie pans, pyrex, or bowl large enough to allow dredging the chicken breast. Add a pinch of salt to flour and panko, mix to combine. Place oil in a 12 inch pan. 3. Dredge/dip chicken into flour, tap off excess, then into egg, then panko. Place on parchment or wax lines baking sheet. Repeat with all chicken. Place pan and oil over medium heat, once shimmering, place 2 pieces of chicken in oil. Fry for 5 minutes, turn and fry for 5 minutes. Remove and place on paper towel lined plate. Repeat with remaining chicken breasts. 4. 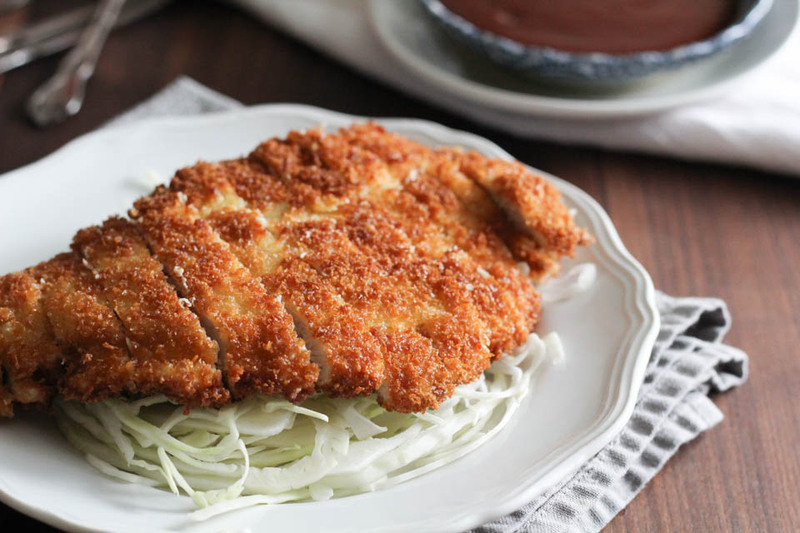 Serve immediately warm with tonkatsu sauce, sliced cabbage, and rice. How to make Kimchi at home. Black Bean Tofu, 20 minute meal. Steak with Kimchi Butter from Steamy Kitchen. Asian Beef Noodle Salad from Savory Simple. Kimchi Fries from Nutmeg Nanny. Korean Flank Steak Tacos with Asian Pear Slaw from Mountain Mama Cooks.